Every year on Black Friday we count the number of homeless people sleeping downtown. By the way, can we change the day after Thanksgiving to Malcolm X Memorial Day instead of naming a day after commercial activities? We can still call it Black Friday, but just for a different reason. This year saw a pretty large increase from the three sleeping outside in 2012 to 2014 to eight in 2015. It is no where near the dark days of 1998 with 60 people sleeping around the welfare building and on Public Square, but it does reverse a trend from the last three years. It could be an anomaly because of the nicer weather, but I seem to remember 2012 being a warmer Black Friday. It could be that the larger number of women and families requesting shelter translates to larger numbers outside even though we did not count any women downtown last week. The longer that a shelter is operated the more people who have a negative experience at that facility and will not go back. The longer we have 2100 Lakeside as the main shelter for men, the more likely that a low income individual will have some contact with the facility. They may have stayed there and had their documents stolen or gotten in a physical altercation with another resident. They may have been disrespected by a staff or a volunteer and may have decided to not return. We have not seen a radical change in the shelter since 2002-3 when the shelter was taken by a different non-profit and could say, "Give us a try, we have all new management." The large number of people sleeping on the West Side may view the relative open space downtown as attractive. Shelter resistant people may be moving back downtown because the West Side is "overcrowded," and they value their solitude. 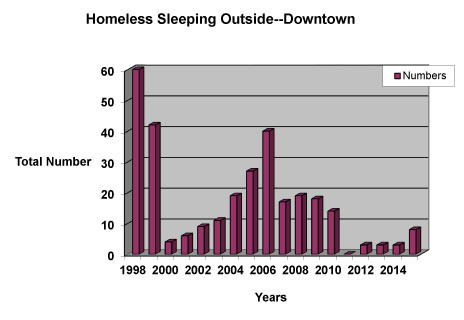 In 2013, we detailed some of the reasons for the decrease in the number sleeping downtown as we also talked about those same issues in 2012. Here is the 2014 summary of the count. Much of the success we have seen still exist, but there are some dark clouds on the horizen. We lost more shelter beds over the last year, and 2016 will see the loss of 82 beds with men's transitional decreasing. We continue to see a lack of Rapid rehousing funds to meet the demand, long housing waiting lists and a sudden change in the hours for Coordinated Intake causing confusion and longer stays at shelter. We continue to "divert" people seeking shelter to their cars or the streets. I got to talk to Yuri, Kenny, and George but the rest of the folks were asleep. No one said that they were being harrassed by anyone, which is good. We gave away many blankets, gloves and socks to the people we met. We hope that this is just a one off increase, but community leaders should come together to make sure that the tools are in place to prevent this increase from becoming the norm. This increase is in contrast the rosy picture presented by HUD in September as they announced the results of the faux "complete" counts in January of every year. We do not want to return to the days when there were dozens of people downtown. We usually consider this the low number for the winter because it is the holidays and families take their kin in during Thanksgiving. It was also the time that Mayor White directed the police to start harassing homeless people as the Christmas shopping season started.